Mildred I. Allegre, 93, of Crown Point, Indiana and formerly of Cedar Falls, died Saturday, February 17, 2007 at Wittenberg Lutheran Village, Crown Point, Indiana. 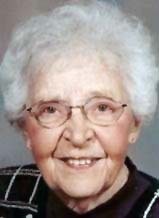 Mildred was born November 28, 1913 in Huron, Kansas the daughter of Lawrence W. & Laura (Harris) Snickles. She married Charles F. Allegre June 7, 1938 in Osage City, Kansas. He preceded her in death November 4, 1981. Mildred graduated from high school in Everest, Kansas, attended Highland Junior College and graduated from Kansas State Teachers College in Emporia, Kansas. She was a Record Analyst in the Registrar’s Office at the University of Northern Iowa from 1965 until retiring in May of 1980. Mildred was a member of First Presbyterian Church in Cedar Falls. Survivors include two daughters, Susan (Kirk) McQuiston of Lowell, Indiana and Laurnet (Scott) Spalding of Maquoketa, Iowa; four grandchildren, Andrew, Katherine, Leslie, and Laura. She was preceded in death by her parents and husband, three brothers, Lawrence W. Snickles II, John Snickles and Robert Snickles; and two sisters, Mary Jacobs and Alma Haigler. Funeral services will be 10:30 a.m. Saturday, February 24, 2007, at First Presbyterian Church with interment in Fairview Cemetery. Public visitation will be from 4 to 8 p.m. Friday at the Dahl-Van Hove-Schoof Funeral Home and for one hour prior to service time at the church on Saturday. Memorials may be directed to the church.